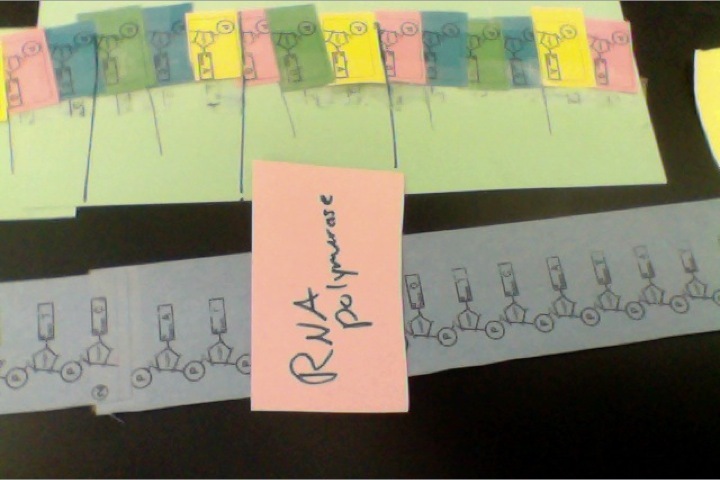 After the RNA strand is made a 5' GTP cap is added, and a poly-a-tail is added to the other end... 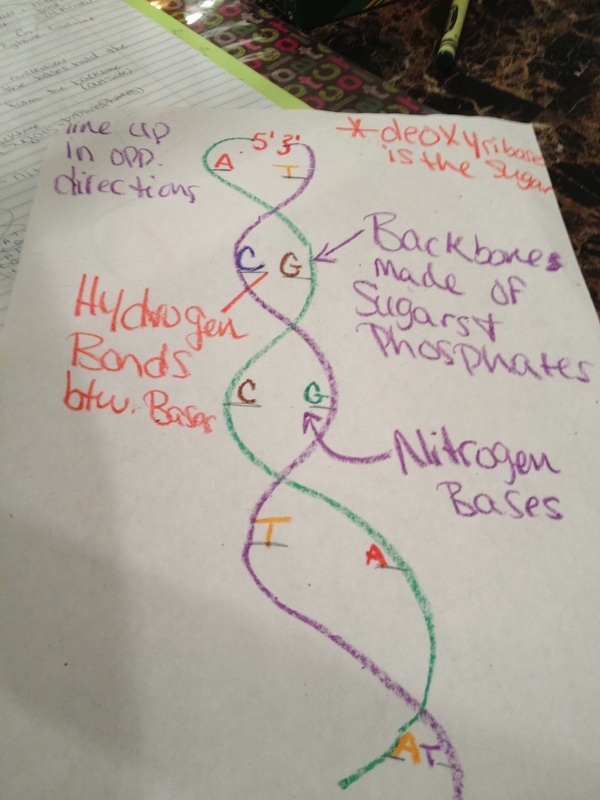 The bases are paired up and read as codons (3 bases). 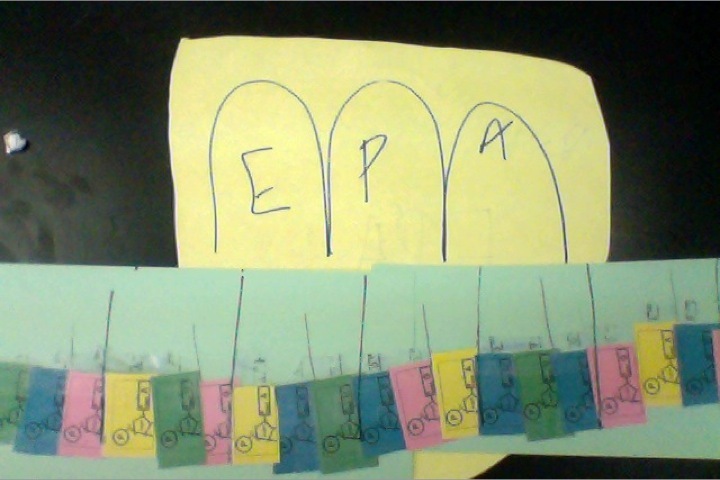 The ribosome EPA, works from A to E. The ribosome starts at the codon "AUG" and works down from there to a stop Codon (UAA, UAG, UGA), and proteins are made. 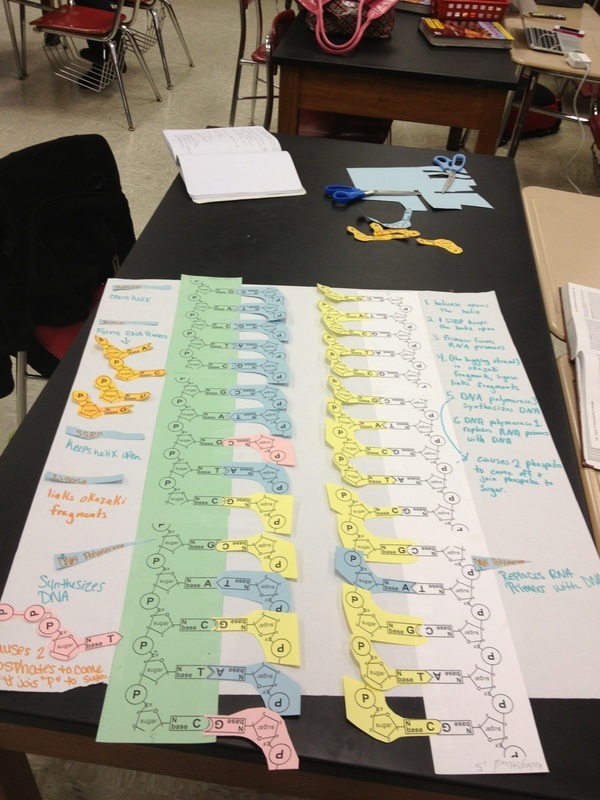 TRNA changes the codons to proteins and then a bond is formed between the other protein and the trna is gone. the proteins are released into the cell. The leading strand can replicate straight down. The lagging strand has to pick up a fragment then replicate, it has to stop, while the leading strand can go on continuously. The lagging strand has Okazaki fragments which has to be put together by ligase. They face in opposite directions. Griffith. What	did	the	results	of	their	experiment	suggest? experiment	demonstrate	that	DNA	was	the	genetic	material	of	bacteriophages? 4. What	is	important	about	the	work	done	on	DNA	by	Erwin	Chargaff? and	Crick’s	model	of	the	structure	of	DNA. a. At	least	one	A,T,C,G	per	strand. hydrogen	bonds	per	base	pair. c. Make	sure	to	show	the	anti-parallel	orientation	of	both	strands. I observed that the green from the spinach leave moved up the paper once the solvent was in it. Each pigment were different colors. They went from a lime greenish, to a darker green, to a dark yellow, to a yellow, and finally to a yellow/orangish. Chromatography helps to separate and identify pigments. In the lab the solvent moved up the paper through capillary action. As the solvent moves up the paper, it takes the substances that are dissolved in it as well. Therefore the pigments are different, they are at different rates. The lines on the paper show where the pigment changes. Pigments in Photosynthesis: Plants have chlorophyll's which has oxygen and nitrogen in it. Chlorophyll a is the main pigment in photosynthesis in plants. It's a reaction of photo systems. Carotenoids protect photosynthetic system from damaging effects of UV rays. Plants absorb everything except green in the light spectrum which is why we see green. How does temperature effect the rate of photosynthesis in spinach leaves? Hypothesis: I think the hotter the temperature is, the slower the leaves will grow. Interphase is the beginning of the process. In interphase the cell grows and copies its chromosomes in order to prepare for cell division. There are different stages in interphase. In the G1 phase the cell grows. In the S phase the cell continues to grow as it copies its chromosomes the chromosomes are replicated in this sub-phase. 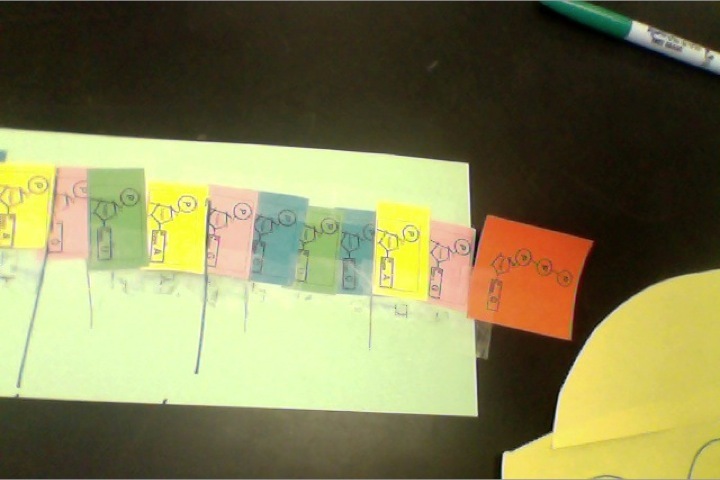 In G2 it continues to grow to prepare for cell division. In the M phase the cell divides. This process is repetitive. In this video it shows the chromosomes just being there (out of order and just there) and then it showas that the chromosomes are replicated. This shows prophase. The chromosomes are more structure than before. The chromatin fibers are put together and the nuclear envelope begins to disappear. 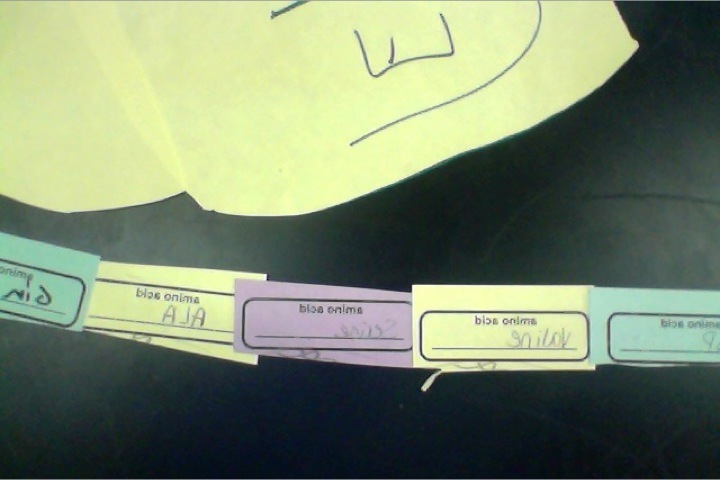 When this happens the DNA shortens and thickens and the centrioles move to the poles. The duplicated chromosomes are shown. In Prometaphase the nuclear envelope in disappearing. and the chromosomes begin to move toward the middle of the cell. Metaphase is a long process which lasts about 20 mins. 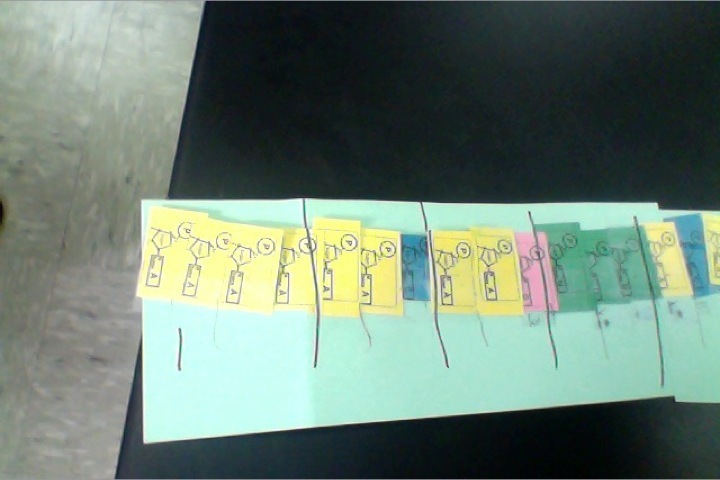 In this phase the chromosomes line up at the center so they can prepare for separation in the next phase (anaphase). The two sister chromatids are pulled apart during anaphase (short phase), The spindle fibers are what pulls the chromatids apart. The spindle fibers is what pulls the sister chromatids away from each other. In the last phase, telophase, two daughter nuclei begins to form. the nuclear envelopes reappear. There are now two new daughter cells! The video says that the signal is sent from the axon terminals, but it is sent from the nucleus and then out the axon terminals. The signal is sent from the cell and out through the axon terminals... The axon carries impulses away from the cell body of the neuron. The myelin sheath surrounds the axon in neurons. The cell body is what sends the signal and the signal goes through axon terminals. When it goes through the axon terminals it is released and tells hormones what to do. The nucleus has DNA which is changed to RNA by RNA polymerase. The mRNA travels out of the nucleus, to the ribosomes and instructs the ribosome to make a protein. The codons determine which protein it is. The Golgi apparatus sorts and packages the proteins once they are made.